043 – The shortest way to a man’s heart? 212 – Rocket in yer pocket? 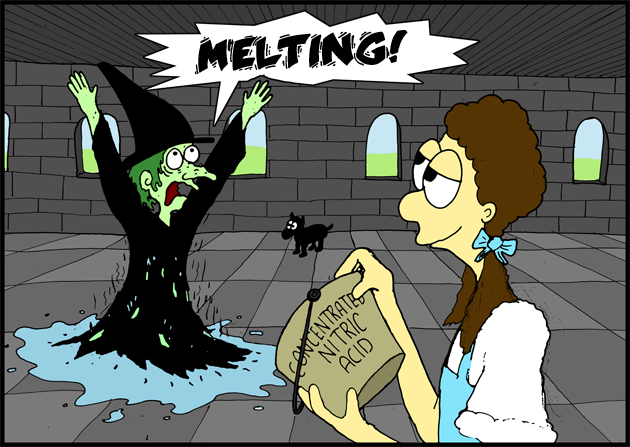 In the wizard of Oz, The witch melts when some water is dumped on her, (no idea why). Acids have a low pH, alkalines have a high pH. So putting a low pH liquid on a high pH creature has some pretty disasterous results, and provides a far better reason for the witch melting other than “oh yeah, she’s soluble”. She has a pH of 10.2?!!? That’s not your average witch — that’s your basic witch. LMAO! That joke trumps this comic! Thanks, it’s been ages since I read it (I was like 7), slipped my mind. I’ve always presumed it was really, really hot water. Otherwise it totally doesn’t count as melting. Then again, maybe witches don’t worry about semantics while they’re dying. No, he wins two internets and one cookie!